Plan for expenses. Short-term expenses happen in the next month; mid-term expenses occur in between one month and a year; long-term expenses are longer than one year. Cut spending. A budget shows just how much money an individual spends on certain items. People who see this might have an incentive to cut spending in certain areas. Spend wisely. If your teen is spending more than he or she earns, something has to change – the teen will have to earn more, spend less, or both. For a teen who earns more than he or she spends, help figure out a plan for the surplus (e.g., spend, save, invest). Save for future goals. Help your teen "find" the money to set aside for future expenses. With a budget, you can identify areas of extra spending and reallocate that money towards a future goal. Develop lifelong money management skills. It’s priceless to learn as a teenager how to save for a goal. For most people, this is not as simple as setting aside a certain chunk of money each paycheck. It usually involves making spending choices and prioritizing savings over wants. A budget is an outline of income and expenses. To create a useful budget, you need to make accurate and realistic projections for how much money is coming in and how much money is going out. Typically, expense estimates are based on the past one or two months of spending, so it’s a good idea to have your teen record all expenses – even the tiny ones – for a couple of months before sitting down and developing a budget. This helps ensure a realistic budget. Most teens prefer to use a budgeting site or app like Mint.com to make a budget, but you can also do it the old-fashioned way with paper and pencil or by using a spreadsheet program. The best method is the one your teen is most enthusiastic about: You want to make the budgeting process as fun as possible so your child has the motivation to stick with it over the long term. Keep in mind, too, that as your teen becomes more adept at using budgets, he or she may choose a different method. That's OK; just keep the process rolling. Your teen's budget should include income projections and expense projections. Note: Your teen can either include after-tax income projections, or before-tax projections with a corresponding expense category to cover taxes. Budgeting for expenses is usually a bit trickier. Some expenses are known – such as the premium for car insurance (or your child's share of this expense). Others require your teen to make a best guess based on history (this is where writing down a few months of spending can be helpful). Your child may have a fixed amount of income each month, or it could change throughout the year. For example, many teens work extra hours (or even multiple jobs) during the summer months when school is not in session. 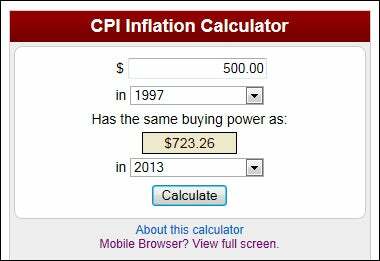 Similarly, spending is likely to differ throughout the year (perhaps a down payment on a car?). Creating a budget that addresses each month can deal with the fluctuations in income and expenses that occur throughout the year. Your teen may create a separate budget for each month, or a new column for each month as part of a master budget. To create the budget, have your teen enter his or her estimated income, plus expenses for payments they have to fit in the budget (e.g., car payment, gas, mobile phone, saving for college). After those expenses have been accounted for, your teen can allocate the rest towards discretionary spending. 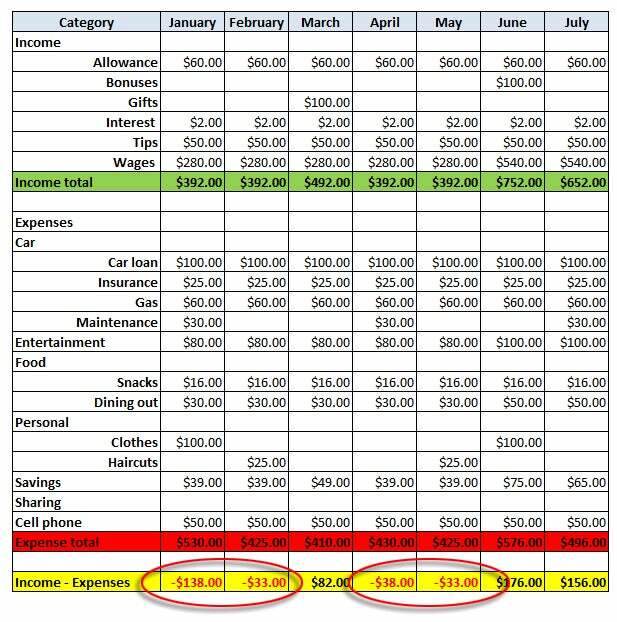 The last row (Income – Expenses, highlighted in yellow) shows if the budget is balanced for the month. 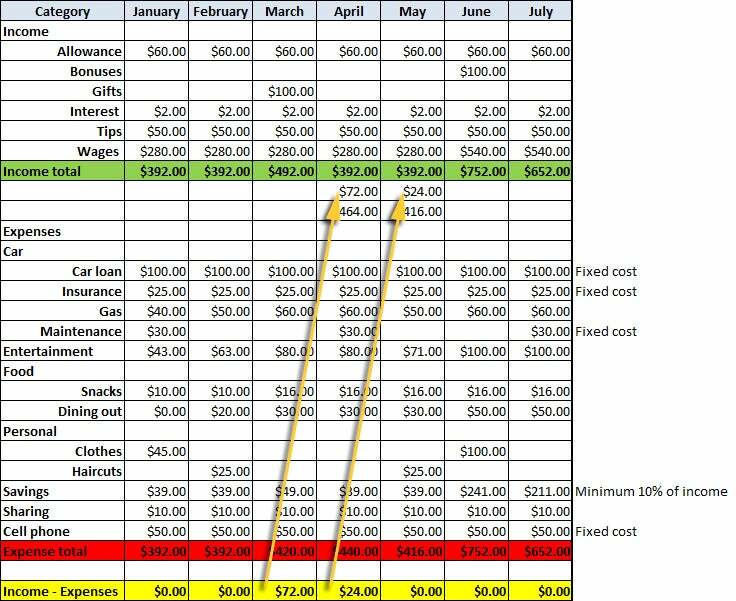 If any month ends up in the red, your teen will have to revise the discretionary spending to balance the budget. Without a budget, the teen in this example might have come up short in one or more months. With limited income, a budget will be tight. Expenses such as the car loan, insurance and cell phone, which can’t be changed, have to be paid first. Any extra money can then be divided among the other categories, reallocating as necessary until expenses fall within the income constraints. The first budget may be an eye opener for your teen: A budget really enforces the fact that money is in limited supply (for most people) and that, as a result, you have to make spending choices. It may be tough for your teen to realize that he or she can only go out to dinner once during February, for example, but it will be a lot harder to not have the money to pay a required bill, such as the car insurance. Planning, however tough it may be at times, helps ensure that money is intentionally – and wisely – spent. Budgeting should take inflation into consideration: Many of the goods and services your teen is accustomed to buying may increase in price next year as a result of inflation. Make sure your child understands this concept so he or she can plan accurately and avoid going over budget during the year. If your child is working a summer job, here are some rules you should know about what he or she is allowed to do. Use these questions to have a successful discussion with your teen about financial security. Here's how to talk to your teen about managing their money. There are a lot of summer jobs out there, find out what's available, how much it costs and what skills you need. A personal budget is a useful tool for tracking your income and expenses.